Can you please tell us a little about yourself and your career? 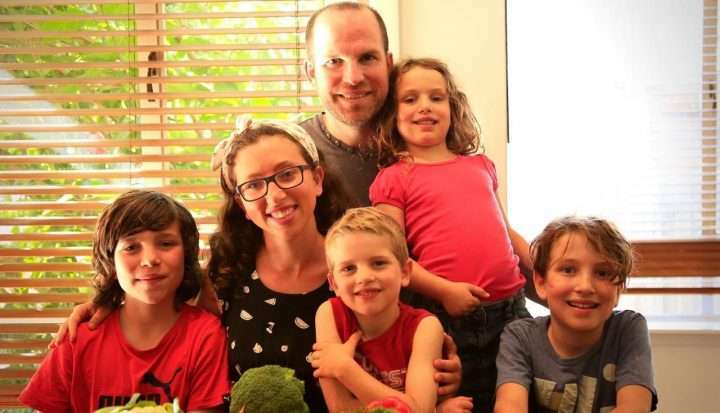 My name is Kate and I’m a mum of four and a dietitian. Being a dietitian, I started off being trained in a hospital, but for me, I was always more interested in health promotion, so rather than following that hospital path, I started doing some private practice work. The more work I did, the more interested I became in behaviour change before it even developed to what it is today and I wanted to go a more “upstream” regarding health promotion. We started doing some kids’ cooking classes and about three years ago, we launched Foost. Foost has one main mission: to get people to eat colourful—to increase people’s intake of fruit and vegetables—it’s literally that simple. We do only group sessions, so I no longer do one-on-one consulting. We really aim for schools and workplaces and homes to create a more positive food culture. With this ‘eat colourful’ message, we’re always talking about what you can eat more of and we also sometimes talk about mindful eating, but in this world where nutrition education can sometimes be a little bit negative, we like to inspire people with positive messages. What’s the reason behind encouraging people to eat colourfully? If you look at all the research, if Australians—and a lot of people around the world—could do one thing nutritionally to improve their health, it would simply be to eat more fruit and vegetables. It reduces rates of cancer and heart disease. Even now, vegetables are being linked to mental health. If you look at all the different diets across the world, and I mean diet in the traditional sense and not the restrictive sense, you see the one common thing that shows good results is an abundance of fresh fruit and vegetables. In Australia though, only one in nine adults eats enough fruit and vegetables. Their power for improving our health, both mental and physical, and energy levels is super high, yet we’re struggling to get people to consume enough. That’s why it’s our main message. Do you think by targeting towards children, it will help them to eat fruits and vegetables for the rest of their lives? Yes. While we do say eat colourful, we tend to promote veggies a little more than fruit; as these can be trickier for kids to learn to like and we ideally want people having more veggies than fruit each day. Veggies are often more bitter, and so sometimes it can be a little harder to learn to like them. We also know that dietary habits track, so what you do nutritionally as a child tends to predict the diet you’re going to have as an adult, which means that if we get kids accepting veggies and eating a wide variety of different colourful fruit and vegetables, it’s going to set them up for life. That’s not to say you can’t change your dietary habits, obviously you can, it’s just quite hard. What are some practical strategies you use to help parents to get their kids to eat more vegetables? There’s quite a few. Learning to like different foods is like learning to like anything—it takes time. So, the first thing we do is teach parents to be patient. Kids need to be exposed to different foods. I talk a lot about exposing children to different coloured veggies and fruits, multiple times—both at the table and away from the table in a pressure-free environment. Learning to like a food is different for every child. Just like some children are naturally better at maths and some are naturally better at sport, the same is true for food. Some kids take a little longer to learn than others, and I think it’s important that we understand that. Learning to like foods is a three-stage process. The first thing we need to do is familiarise children with foods. Familiarisation can be through yourself eating and enjoying vegetables in sight of them. They might not eat them themselves, but if you show you’re enjoying it, and I’m not talking about being over the top and overplaying it, but just showing them and role-modelling, then that’s a positive experience. You might cook with them; you might take them to the supermarket and ask them to put two crunchy, orange carrots into the trolley. You might garden; you might read books about veggies. All of these are getting kids familiar with different foods. The next step is that they would be willing to try them, and it’s important that we realise they need to be familiar with them first. Give them time. We serve meals family-style, so we put them all in the middle of the table and let kids choose what they want. When they’re ready to try, they will, but when we start forcing kids to eat and making sure they have so many more bites or telling them they can’t have dessert until they eat their dinner, we’re not allowing the children control in their choice and we want kids to have a positive relationship with food. What we want to be doing is sharing the power with our children when it comes to eating by offering them food, but not forcing them to try. The third step is then being willing to eat. Just like they need to see it a few times before they might try it, they again need to try it a few times before they are willing to consume it. It’s this three-stage process and as you go through this process, it’s important that parents stay positive and pressure-free. We encourage people to enjoy food with their kids and to stop pressuring them to eat, which can be hard because there’s a lot of pressure on parents when kids aren’t eating enough veggies. But we want kids to learn to like things so that they keep eating them throughout childhood and adulthood. Do you think parents can push too hard, even though they’re trying to do the right thing? One hundred percent, totally out of love. You find yourself cooking two or three different meals out of love. We know they’re important for health, so we just want our kids to eat them. But you need to take a step back to just sit and eat with your kids. We really encourage family meals. We encourage deconstructing meals a little bit, so instead of serving a tossed salad, serve it like a rainbow and give the kids the tongs and let them choose what they want. Don’t overpraise them either, because sometimes when you’re so excited that your child has tried something, you can make too much of a big deal of it. We tell parents really to focus on creating a nice eating environment—focus on reading books about veggies, focus on going to the supermarket and saying, “We need something orange. What orange fruit and veggies should we put in our trolley?” At the table, create nice dinner conversation that doesn’t even need to be about the food. If you want to talk about the food, talk about the colour and the crunch, not “You should eat this because it’s good for you.” Because if we change our focus onto just offering foods in a nice, calm and safe environment without pressure, kids will ultimately learn to eat and enjoy it. I really want families to start to love food again with their kids rather than it be this warzone that it can be. Are there any strategies you use beyond making it a relaxing environment? Do you have any meal examples or any ways you make vegetables more exciting? A lot of adults tend to cook the veggies, whereas kids tend to like raw veggies. Teaming foods together also works well. If your child really is happy to eat plain rice and carrots, for example, make sure they are some of the options, but also add some cucumber sticks and maybe some roast pumpkin so that they can feel comfortable with some of the choices, and when they’re ready, there are other things they’re willing to try. It’s important that you put a mix of things you know they already like with new things. Anything deconstructed where kids have the tongs and have the power to put things on their plates is really powerful. When you look at your deconstructed salad or you’re making tacos for dinner, you choose what goes on that plate, but once you put it in the middle of the table, leave it up to your child to choose what goes onto their plate. And the power in that is strong because kids like to control in their life. So many things are controlled by their parents, so putting food in the middle of the table can work well. If you have a situation where you put all the choices out there, but the kid doesn’t choose to eat any vegetables. Is it just about being patient and continuing to offer again in the future? Correct, and you say nothing because to get through that three-step process, you need positive food experiences. If you sit there and say, “You didn’t have any veggies. Come on, put that veggie on your plate!” That negates all the positive work you’ve done. It’s all part of the process. Even if there’s lots of veggies in the middle of the table and the child doesn’t take them, that’s one more exposure to getting them to try it. Basically, if they don’t choose veggies, you eat those veggies. Show that you enjoy them, but don’t overplay it. We also need to remember that some days, kids are hungrier than others. Some days they feel like different foods, and so you can’t really make judgement based on one meal. Don’t worry about individual moments and start planning a bigger picture. Can you please tell us a little bit about the crowdfunding campaign for your book: What if Vegetables were People? When I had my own kids, I thought, “I’ve got this, I’m a dietitian,” but obviously, kids are kids and it doesn’t matter if your parent is a dietitian or not. A bit of fussy eating is part of being a child, but maybe I was a little bit more equipped to deal with it. In saying that, as I raised my kids, my strategies have certainly changed. As I was teaching my kids, I realised how much books are important in education. You’ve got ABC books, you’ve got number books; and I started to see that there weren’t many positive books about fruit and vegetables. There were a few, but they either didn’t hit my positivity enough or they were a little bit preachy. And I’m more about food education and leaving the nutrition until a bit later. Because we know that familiarity and positive experiences are the first steps to getting kids to like a variety of foods, I started to think, “We need to come up with more books for younger kids to have these positive food experiences away from the table so that when they come to the table, they can have those experiences and then learn to try them.” Eventually, we came up with the idea of What if Vegetables were People. There’s a lot of personification of animals throughout children’s books, so I thought, “Why don’t we do the same with food?” I sat down with the kids and we had a bit of a brainstorming activity. It’s hard for children to tell the difference between a zucchini and a cucumber, and if you look at the top, the zucchini looks like he’s wearing a crown, so we made zucchini the king. Then, we thought about the tomato, he’s red, maybe he’s embarrassed or maybe he’s hot from running around. We took the characteristics of the vegetables and made that their persona. The kids did that with me because they’re kids and they should know what kids like more than me! We had it written and illustrated, but to make enough money to afford to get it published, we did a crowdfunding campaign. The campaign was a lot of work, but the support and the connections that I made through that have been amazing. In the end, it got 112% funded and we got about 350 pre-orders of the book, and that was everything from people buying one copy to a couple of businesses who bought enough to give away books to the community. We had a whole range of people supporting us at different levels, which was amazing. We now have it in graphic design getting it print-ready. We’ll also buy a few extra copies and try and keep selling it through our website, but also look at getting it into some schools. One day care centre has bought it for kids for their end of year gifts because even though it’s a fun book—it’s got rhyming stories and beautiful illustrations of veggies, the king and the corn being shy hiding behind its husks—it is definitely an education tool because we know that the first step we need to do is have positive experiences with veggies, and what better way to have a positive family experience than sitting down and reading a book together? Is there anything else you would like to add to wrap it up? There’s also a sequel coming called What if Fruits were Animals! Stay tuned. You can check out more colourful recipes and tips or pre-order the book or check out Foost’s other great products like their kids’ knives, by visiting foost.com.au.